With Flow Analytics, you can track the block-by-block conversion and drop-off ratio in any landbot, learn how! You'll find the Flow Analytics section inside your landbot editor, just click Analyze > Flow Analytics and you'll find something like the image above. Block by block conversion. That number you see over every blue arrow shows the percentage of people that, when reached that block, followed each path. Block drop-off. Red arrows show you the drop-off metric AKA the percentage of visitors leaving the flow at that specific point. Please note that for consecutive Send a Message blocks, the drop-off will always be 0%. 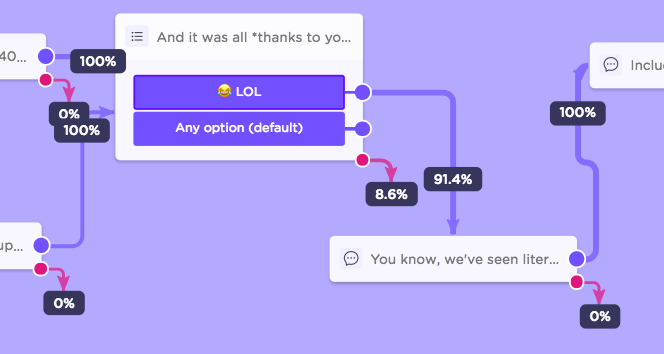 We'll keep adding more and more features to the Flow Analytics section of landbot so you can take your chatbot optimization to the next level, stay tuned!